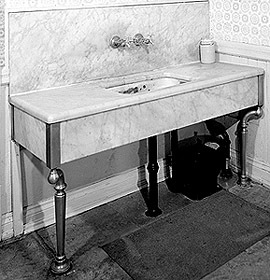 The 1900s had luxurious vintage bathroom fixtures. Compare them with today’s bathroom fixtures to recreate a vintage bath design. Sumptuous bathrooms are not a modern invention; on the contrary, the bath was not only a religion with the ancient Greeks, but a luxury to the early Italians. Therefore, when one envisions a vintage bath design for today’s modern home, he should not immediately look to a dark wood paneled bathroom with a boxed-in metal bathtub. 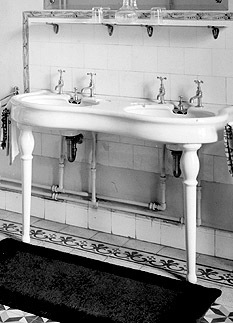 In the early 1900s, vintage bathroom fixtures became so elaborate in number and quality, that the conveniences home owners had in their bathroom were limited only by one's purse. The leading manufacturers at this time anticipated the dreams of the home owner and provided the most luxurious bathroom fixtures. Vintage Fixtures. 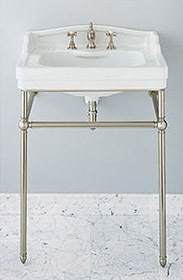 An original vintage bath pedestal sink with nickel faucets and pipes graces a luxurious home. 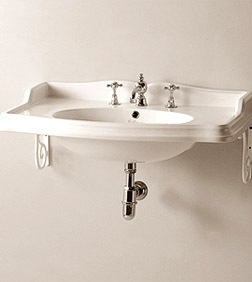 Bathroom Fixtures for Vintage Bath. 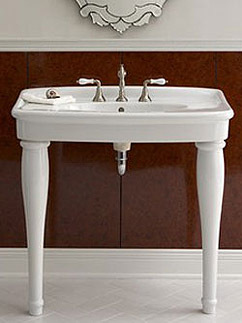 Kohler Memoirs pedestal sink has similar lines to the vintage bathroom fixture shown to the left. By comparing early photographs of vintage bathroom fixtures with today’s available bathroom fixtures, you will see how luxurious the real vintage bath was, and how easy it is to recreate this look and still maintain an inviting modern retreat. Vintage Bathroom Fixtures. 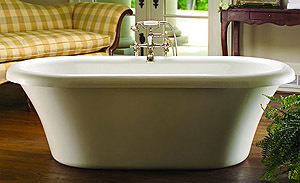 The vintage soaking tub shown above is very similar in shape and size to the modern Kohler bathroom fixture shown below. 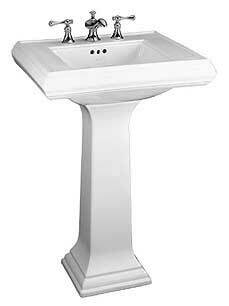 in the bathroom fixture shown below. 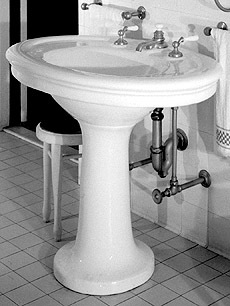 The double console vintage sink on the left looks very similar to the console lavatory by Porcher on the right. The wall mounted marble vintage bathroom fixtures to the left is recreated by a Whitehaus' rectangular wall mount china basin with backsplash. Vintage Bathroom Fixtures. A vintage bath fixture to the left and a modern Porcher Vitreous China pedestal sink with a nickel stand to the right both add grace to a vintage bath. 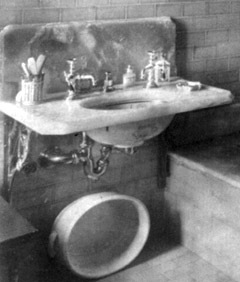 Here are ideas to create a period bathroom that takes you back to another time. 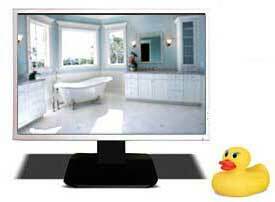 Many homeowners like to go with a theme for rooms when they are remodeling, such as a Victorian bath or a 1950’s kitchen. 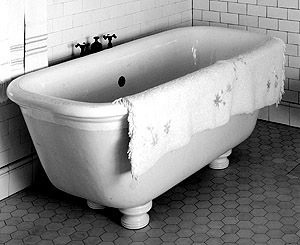 If you are thinking of going with that old fashioned clawfoot tub bath idea, here are a couple ideas on how to design a bath that will take you back to another time. View of an 1883 bathroom interior with painted tiles and mahogany paneled walls for inspriation for your bath remodeling project in your period home. Find vintage bathroom light fixtures to complete your luxury bathroom remodeling project. Think outside the box when designing a new bathroom. 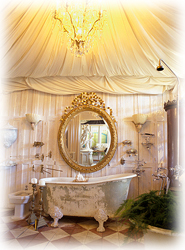 Vintage bath and tub style fixtures add a luxurious atmosphere to any bathroom. Free standing tubs come in several sleek designs. 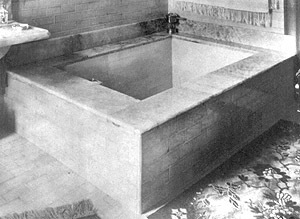 Learn about the Vanderbilt's luxury bath on the east side of Central Park. 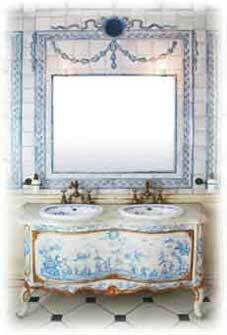 Find inspiration for a Victorian bathroom remodeling project.